Is a white lotus and moon, on which appears the syllable HRIH. Radiating white light that shines in five colors. Handsome and smiling, his gaze is filled with compassion. While the lower two hold a crystal mala and white lotus. While Amitabha resides as his crown ornament. And his backrest is a full moon, free of stains. He is the essential nature of all objects of refuge. 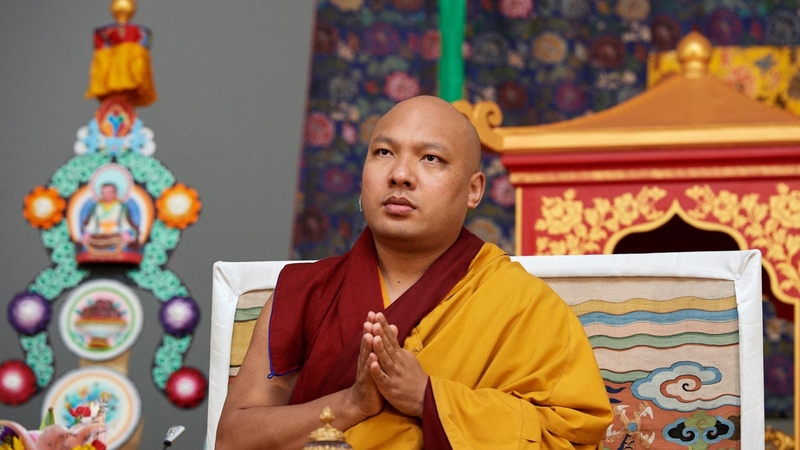 The Karmapa continued, “As you slowly chant these words, reflect clearly on the meaning of each one. As I had mentioned this morning, depending on their physical condition, some people can more easily create the visualizations and others find it difficult. Of course, it is important to work with the form of the deity; however, I wonder if it is that important to see them exactly as in the paintings or statues. What is important is to imagine a white lotus on our crowns and on those of all living beings. A white lotus is something we all have actually seen, so it is easy to imagine, whereas Chenrezik with four arms is not what we normally see. “You might task, ‘What’s the point of imagining a white lotus?’ ‘How could this possibly benefit my mind?’ In the mantrayana, we speak of what illustrates and what is illustrated or the symbol and its referent. These two make connections between our outer and inner worlds, establishing mutual relationships. It is not the shape of the image that is central but its inner meaning. If we can work with our minds in the right way, then over time, the symbolic form will naturally appear imbued with its meaning. Focusing our attention on the form does not help; we should reflect deeply on its significance. “It is essential to understand what a symbol represents. The roots and stalk of a white lotus live in a muddy pond or swamp, but the white flower itself rises above the surface as something delightful and beautiful to see. Therefore, here in the practice of Chenrezik, the white lotus signifies the mind filled with renunciation (the purity of the white lotus) or the wish to be free of samsara (the muddy water). We meditate on a white lotus and simultaneously on its meaning. “Above the white lotus is the mandala or disk of the full moon, the seat of Chenrezik. Here, again, we might ask, ‘Why meditate on a moon disk?’ Because it symbolizes relative bodhichitta. All beings are capable of love, for example, for their parents or for their children but this kind of love is biased or one-sided since we feel it only for those who are close to us and not for others. The moon, however, is full and round, open on all sides. It symbolizes relative bodhichitta, which encompasses all living beings with the wish to bring everyone to full awakening. By meditating on this meaning, the image acquires an emotional coloring, something we can feel, and then slowly, if we reflect well, the form will appear with its meaning clear to us. “The next step is to move beyond our particular situation and see that residing above the crowns of all living beings is noble Chenrezik, the essence of love and the embodiment of great blessings. Through feeling this, our concepts and afflictions naturally subside, because our intellect is engaged in a vast visualization that leaves no room for concepts to arise. 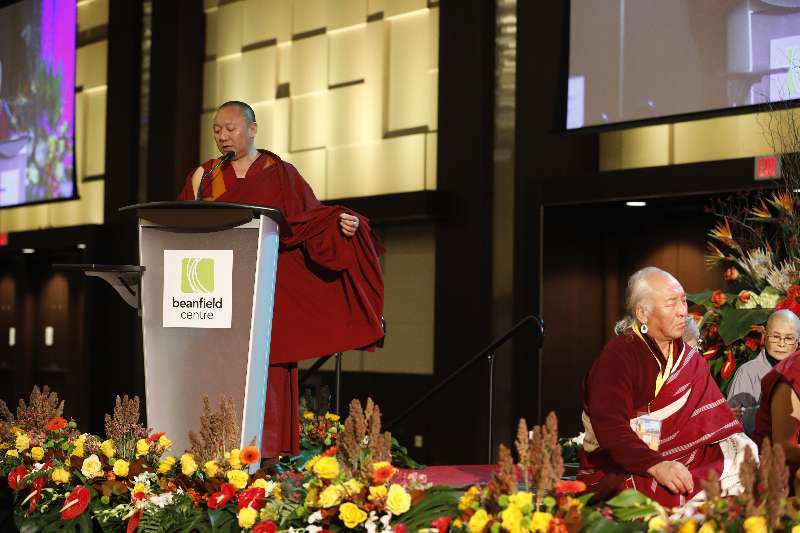 For this reason, it is critical to imagine that Chenrezik—the union of the love and power of all buddhas and bodhisattvas—is present everywhere. “To recap, our mind is trained on the visualization and that focus closes out the constant stream of concepts and afflictions that move through our mind. We also move along the way to becoming like Chenrezik since this practice increases the power of our love. Meditating on a deity is not recalling or fabricating a drawing, painting, or sculpted image. It is not just a thought in our mind. Rather, the visualization feels vivid, alive, truly present, and full of power. Relative bodhichitta is likened to a moon because moonlight has the power to shine all over the earth. Likewise, relative bodhichitta is dynamic and strong like a powerful tool placed in our hands that we could use to benefit others. For all these reasons, we practice meditating on the deity. A perfect Buddha adorns your head. To you, Chenrezik, we prostrate. “We have been imagining Chenrezik above our heads and those of all living beings, and now we think of him as also present in the space in front of us—we are supplicating him and he is looking at us with compassion. 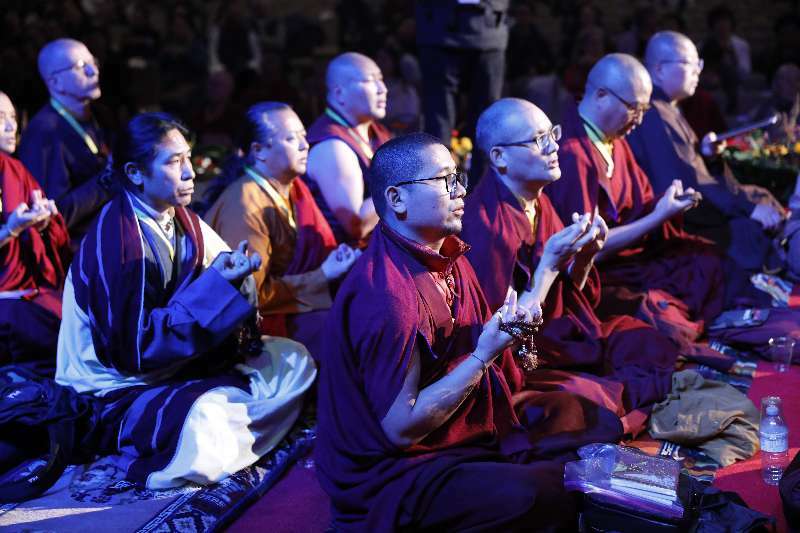 Together with all the living beings who surround us, we recite the supplication as one voice, dedicating ourselves 100% to our resolution of freeing all living beings of the six realms of samsara. We pray to Chenrezik that he will bring them all to his level of omniscience. This supplication can be recited 7, 21 or 100 times or, until this feeling arises in our minds, which is the best way. “As a supplement to this section, we can recite other praises of Chenrezik that are imbued with blessings; for example, the praise in the White Lotus Sutra, ‘the Praise of Noble Chenrezik’ by Gelongma Palmo, or ‘the Lamentation Requesting Blessings from Chenrezik’ by Chandrakirti. 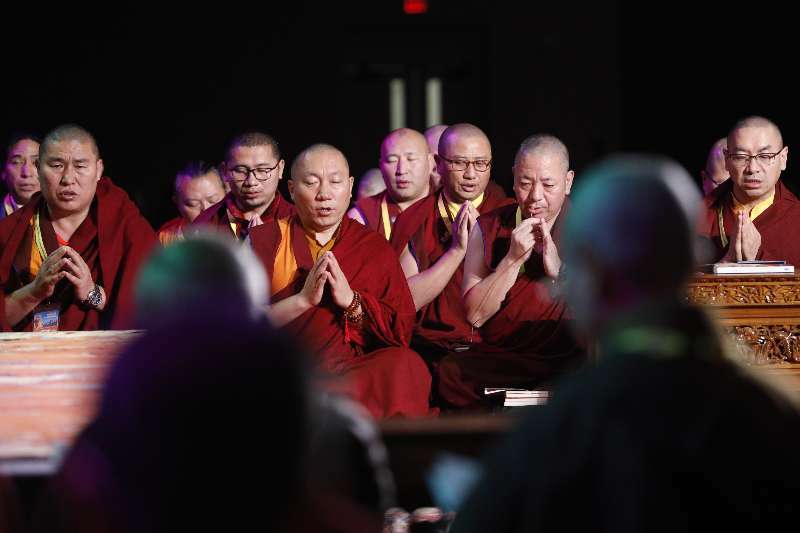 The main point here is that we discover and feel confidence and trust in Chenrezik as we think, ‘You are the one who knows.’ ‘Through this and all my many lives, I trust in you completely.’ It does not make any difference which praise you recite as long as it is one that you know and one that moves you deeply. This ends this section, Supplicating and Invoking the Mind of Chenrezik. Reciting the Mantra Part Two: The Practice of Realizing the Deity’s Body, Speech, and Mind through Sending Out and Drawing Light Back In. “Through our supplicating Chenrezik one-pointedly, we have invoked his mind, and from his body above our crown, infinite white lights hued in five colors radiate and permeate us and all living beings. This clears away the thick darkness of ignorance, present for infinite eons and never before illuminated. Also purified are the actions of immeasurable consequences, the ten misdeeds and similar actions of body, speech, and mind as well as the vows and commitments that we have transgressed. We feel that we have received all the blessings of Chenrezik’s body, speech, and mind. “By meditating in this way, we have become inseparable from Chenrezik and our body is transformed into his. Likewise, the beings of the six realms surrounding us are permeated by his blessing and they, too, turn into Chenrezik, so that all living beings take his form. The place where they reside, the container of the external world, is also transformed into a pure land or Dewachen, the pure land of Amitabha. Further, the speech that is orchestrated by our mind and the sounds that are not (such as those of the natural elements) become the six-syllable mantra, the very essence of Chenrezik’s speech. Finally, everything that comes to mind, all memories and concepts, turn into awareness and emptiness inseparable, the very essence of Chenrezik’s mind. In brief, we imagine that all appearance, sound, and thought are transformed into the great bliss that is the deity; we have become the very nature of Chenrezik’s body, speech, and mind. Purifying tainted karmic appearance and confused consciousness. Appearance, sound, and awareness are inseparable from emptiness. 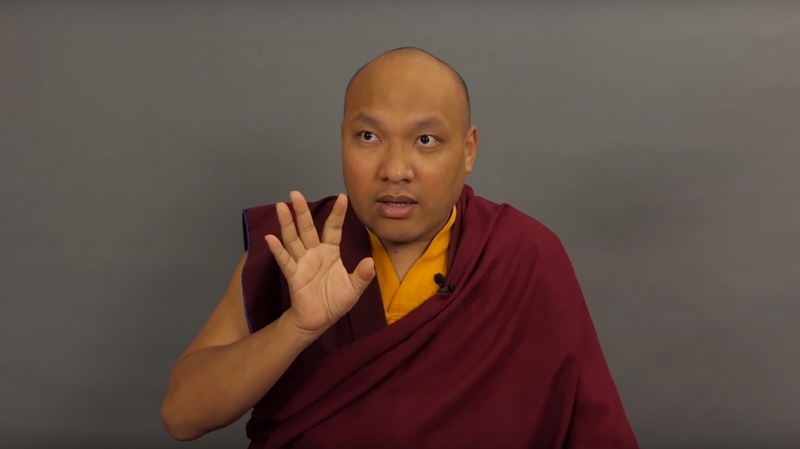 The Karmapa continued, “After this comes the recitation of Chenrezik’s 6-syllable mantra Om Mani Padme Hung, which can be explained in many different ways. This is the main part of the practice, which we will look at tomorrow. 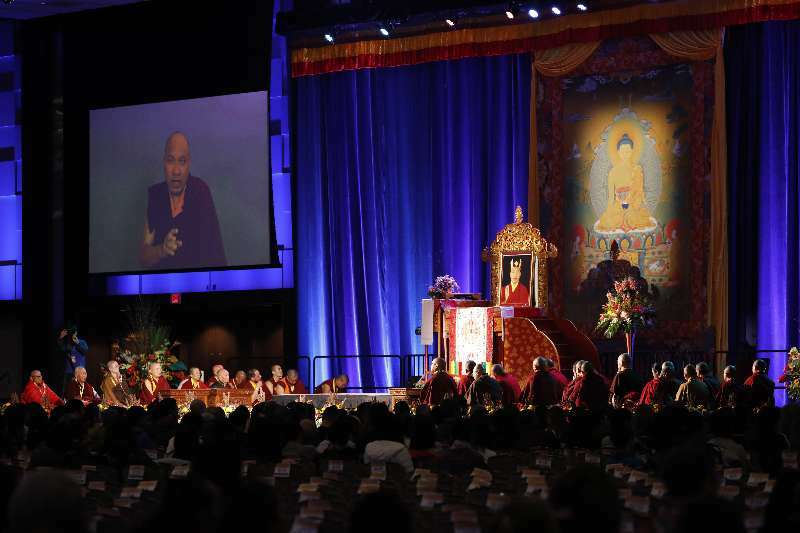 At the end of his talk, the Karmapa asked that the audience write down their questions they might have and give them to the organizers. Since not all of them could be answered, they will chose among them the ones that are not personal but relevant to many. The Karmapa said he would answer them the next day in the afternoon and hoped that this would be helpful to all the people who had come. The Karmapa began this morning’s teaching by discussing Chenrezik’s six-syllable mantra, Om Mani Padme Hung, famous throughout Tibet. When children are about two years old and learning to speak, they learn this mantra, and so it can be found basically wherever Tibetans are living. The practice of Chenrezik’s mantra is also part of Tibet’s tradition of the secret mantrayana, which has preserved the profound oral instructions of the tantra related to Chenrezik. 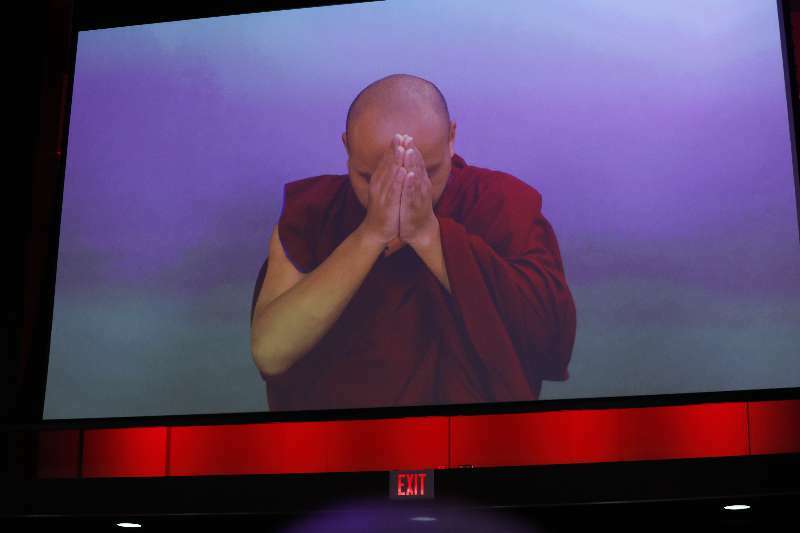 The Karmapa continued, “As I had mentioned earlier, Tibet is considered the realm to be tamed by Chenrezik. 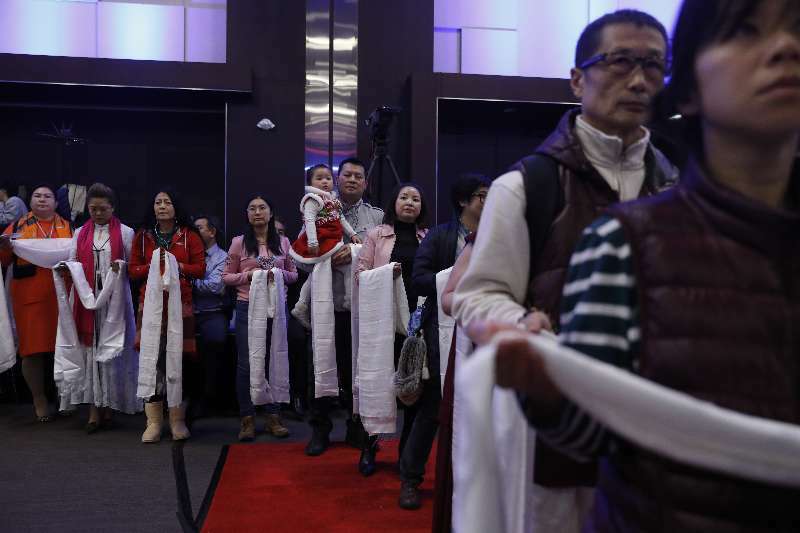 Since this has been the case for centuries, it is not a question of whether a Tibetan has taken up the practice of Chenrezik or not; the very fact of being born Tibetan means that Chenrezik is one’s spiritual sovereign and guide. For a long arc of time, Tibetans have had a strong belief in Chenrezik. 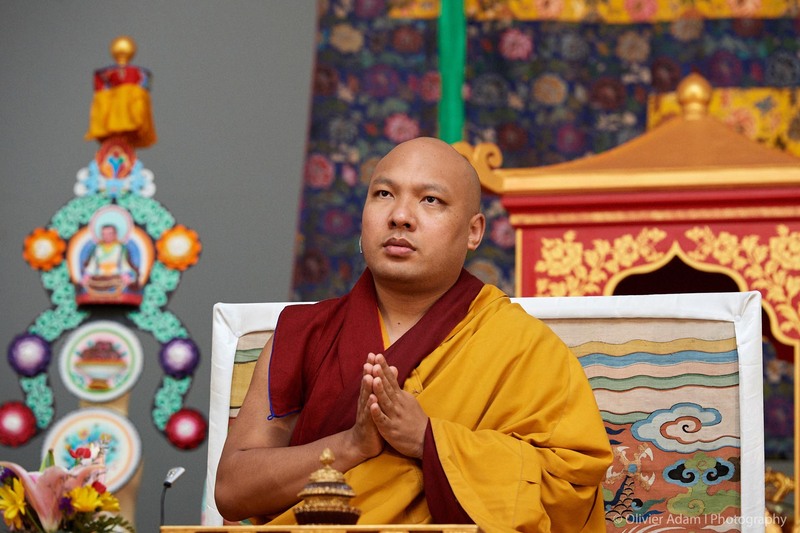 “There is a close connection between the Karmapas and Chenrezik. The Fifth Karmapa, Deshin Shekpa (1384–1415) was invited to the court of the Ming Emperor Yongle (1360–1424). Knowing that the Karmapa was an emanation of Chenrezik, the emperor asked, ‘What is the best? 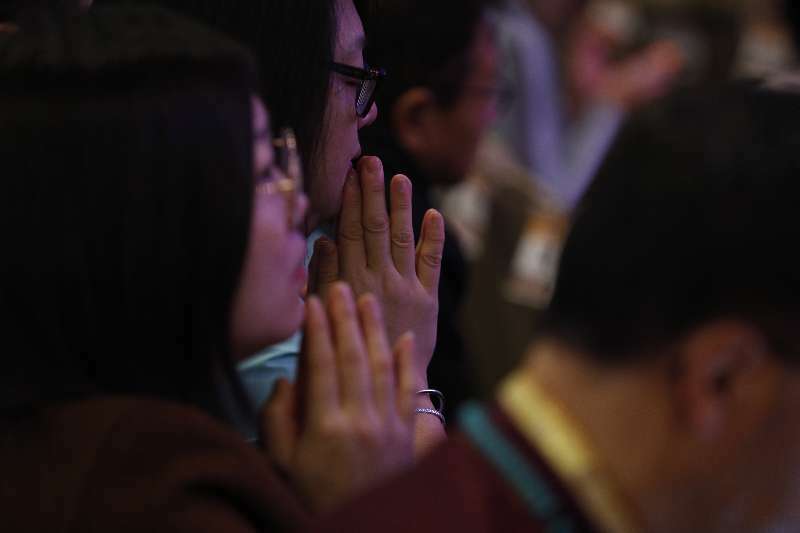 Shall I recite supplications and praises to Karmapa or repeat a mantra based on his name?’ The answer was ‘Recite the six-syllable mantra.’ (The name mantra, ‘Karmapa khyenno’ came later.) At that time in China, the practice of the six-syllable mantra was not very widespread, and the interest in tantra was also limited. 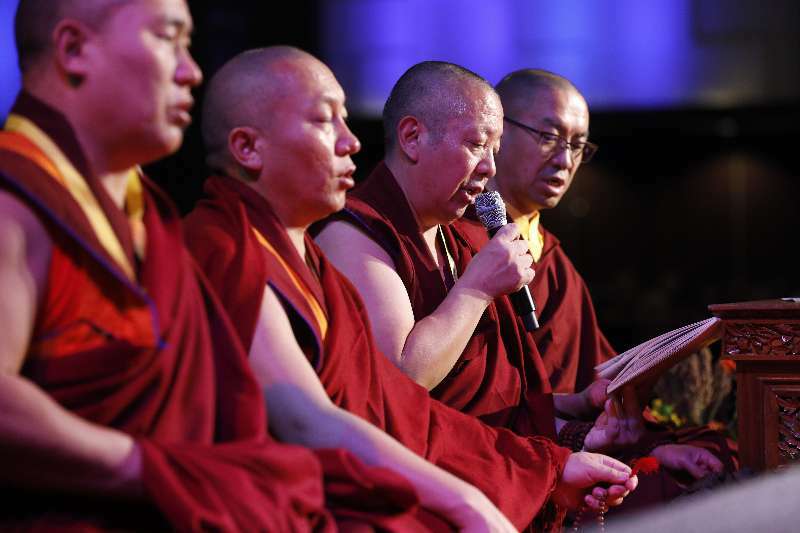 Due to the Karmapa’s visiting the emperor, many people began reciting the mantra and it became an important practice. “From one perspective, the six-syllables are the name mantra of Chenrezik. From another, Chenrezik is a bodhisattva who embodies the great compassion of all the buddhas and incorporates their bodhichitta and activities as well as all of their power. This means that his mantra has the potency of what are known as truthful or powerful words. His strength and commitment to help others was inconceivable and so the benefits of his mantra, these words of truth, are wondrous. “One way of understanding the vast power of the mantra is to relate various sets of six qualities to the six syllables of the mantra. The first set is the Six Paramitas or Perfections. In their respective order, Om refers to the Perfection of Generosity; Ma to the Perfection of Ethics; Ni to the Perfection of Patience; Pad to the Perfection of Diligence; Me to the Perfection of Meditative Concentration; and Hung to the Perfection of Wisdom. The second set of six refers to the sufferings of the six realms that are eliminated through the power of the mantra. Om refers to the suffering of change and downfall in the god realm; Ma to the suffering of combat and quarrel in the demi-god realm; Ni to the suffering of stress and poverty in the human realm; Pad to the suffering of dullness and stupidity in the animal realm; Me to the suffering of hunger and thirst in the hungry ghost realm; and Hung to the suffering of heat and cold in the hell realms. 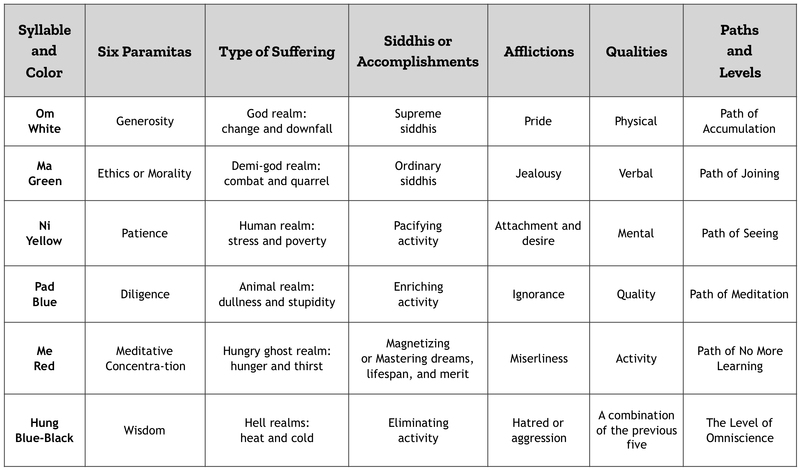 “The third set of six relates to the various kinds of siddhis or accomplishments. The first two are known as the ordinary and supreme siddhis or the mundane and transcendent siddhis. The last four of the six syllables are particular instances of the common siddhis, referring to the four types of action—pacifying, extending (or enriching), magnetizing (or mastering), and eliminating. Specifically, Om refers to the supreme siddhi; ma to the ordinary siddhis in general; Ni to the siddhi of pacifying sickness and negative spirits; Pad to the siddhi of extending life and merit; Me to the siddhi of magnetizing (dbang ’gyur) or mastering dreams, lifespan, and merit; and Hung to eliminating enemies and obstructers. “The fourth set of six refers to the afflictions that are eliminated. Om purifies pride, Ma purifies jealousy, Ni purifies attachment, Pad purifies ignorance, Me purifies miserliness, and Hung purifies hatred. The fifth set of six refers to the benefits of various qualities. Om refers to the quality related to the body; Ma, the one related to speech; NI, the one related to the mind; Pad, the one related to qualities; Me, the one related to activity; and Hung represents the combination of them all. The sixth set of six is drawn from the context of the paths and levels. Om refers to the path of accumulation; Ma to the path of joining; Ni to the path of seeing; Pad to the path of meditation; Me to the path of no more learning; and Hung to the level of omniscience. A syllable-by-syllable explanation of the mantra of Chenrezik, Om Mani Padme Hung. “These sets of six lay out the numerous benefits that reciting Chenrezik’s mantra can bring. But merely saying, ‘These are the benefits’ will not make them happen. We need to learn how to do the practice. Of the six sets we just looked at, the most important here is the second one of purifying the six realms and clearing away their specific type of suffering. “The practice is done in the following way. From the white Om, white light radiates and purifies the god realm, clearing away the suffering of change and downfall. From the green Ma, green light radiates and purifies the demi-god realm, clearing away the suffering of combat and quarrel. From the yellow Ni, yellow lights radiate and purify the human realm, clearing away the suffering of stress and poverty. From the blue Pad, blue lights radiate and purify the animal realm, clearing away the suffering of dullness and stupidity. From the red Me, red lights radiate and purify the hungry ghost realm, clearing away the suffering of hunger and thirst. Finally, from the blue-black Hung, blue-black lights radiate and purity the hell realms, clearing away the suffering of heat and cold. “While we are reciting the mantra, we visualize ourselves as Chenrezik and clearly imagine in our heart the six syllables facing inward, set up in a circle like a wheel and turning clockwise. Alternatively, reciting the mantra and visualizing ourselves as Chenrezik, we bring to mind clearly an Om arising in our heart. It radiates brilliant white light that clears away the suffering of the gods. Then, for the remaining five syllables, we visualize in the same way but change the respective colors, realms, and sufferings. 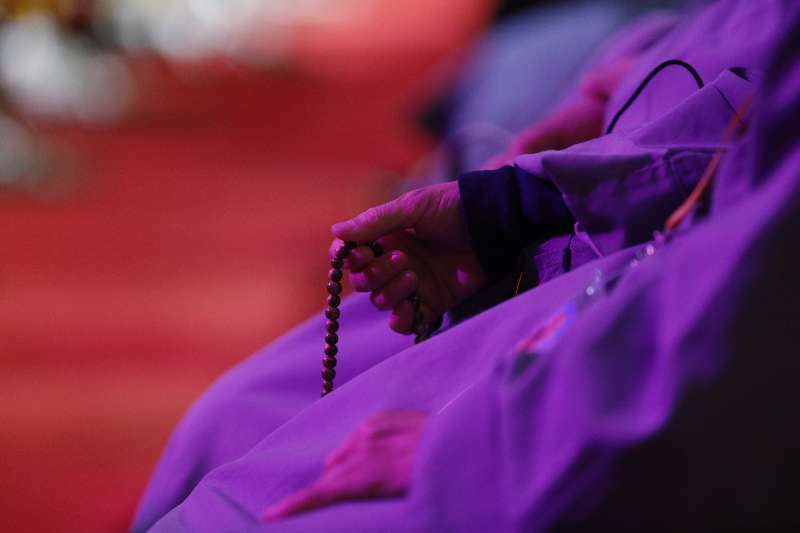 “How many mantras should we recite? When on retreat, we can divide the day into four sessions (two in the morning and two in the evening) or into six sessions (three in the morning and three in the evening) and also decide on set a number of repetitions to do. If not on retreat, we can repeat as many mantras as time allows—the number is not predetermined. When we have finished the number of repetitions we set out to do, or if the time of a session has come to an end, we start the dissolution phase. From the body of Amitabha, the Lord of Chenrezik’s Family, red light radiates and transforms the world into the pure land of Dewachen and all beings into Chenrezik. This visualization then dissolves into light, or you could say it takes the form of light, and further dissolves into the Chenrezik, visualized in front of us, who dissolves into light and into us. “Finally, we dissolve into light that has the nature of emptiness and clear light inseparable like luminous space. We reflect on emptiness and the sequence of visualizations that has brought us to the place where the meditator does not truly exist, the object of meditation, Chenrezik, does not truly exist, and the activity of meditating does not truly exist. Within this utter purity, freed of grasping onto subject, object, and action, we rest evenly in the dharmata (suchness). Appearance, sound, awareness are inseparable from emptiness. “While we are meditating like this, thoughts will come and go. They are the delusions of concepts or our relative truth. Our visualizations also arise from thinking; however, in the end, we must be able to return to what is present as the nature of the dharmata. If we are just moving from one thought to another, remaining stuck in the deluded world of our thinking, we will not be able to abandon our self-fixation. If we cannot do that, we will never come to the level of liberation. It is crucial to rest evenly in emptiness (or non-self) exactly as it truly is. Therefore, keep in mind that after dissolving the visualization, we should reflect for a few moments on no self or emptiness and then rest evenly in meditation. This is the key point. Will remain successively in our minds. The aspirations we have made. The treatises of scholars and the key instructions of past lamas speak of similar ideas: Our wishes, interests, and aspirations determine the result we find. The thoughts we have, the goals we set, and the plans we make will shape the outcomes we experience. Even if we are practicing for just one session, the attitude we have before starting it will color that time and its result. “Often the Kadampa texts speak of the three types of individuals (lower, middling, and superior), based on what kind of intention they have. The lower type practices to be free of the sufferings in lower realms (hell, hungry ghost, and animal) and that is the extent of their benefit. The average type sees that samsara is nothing but suffering and practices to be free of it; this intention will set the limit of their result. Finally, the superior type practices to attain buddhahood or omniscience, and their result will harmonize with their intention. “Clearly then, it is important to consider and set our intention before we start a practice, checking to see if it is pure or not. If it is not pure, we can revise it into a pure one that harmonizes with the Dharma. For example, if we are practicing in the mahayana, we look to see of our intention matches this path. It is the same if we are practicing the hinayana (foundational vehicle) or the vehicle of the mantrayana. We are always checking to see of our intention accords with our practice. If it does not, then the Dharma will not really be the Dharma. From the outside it may look like Dharma, but ultimately it is not true as Dharma. “The results of our practice depend on our motivation and way of thinking. 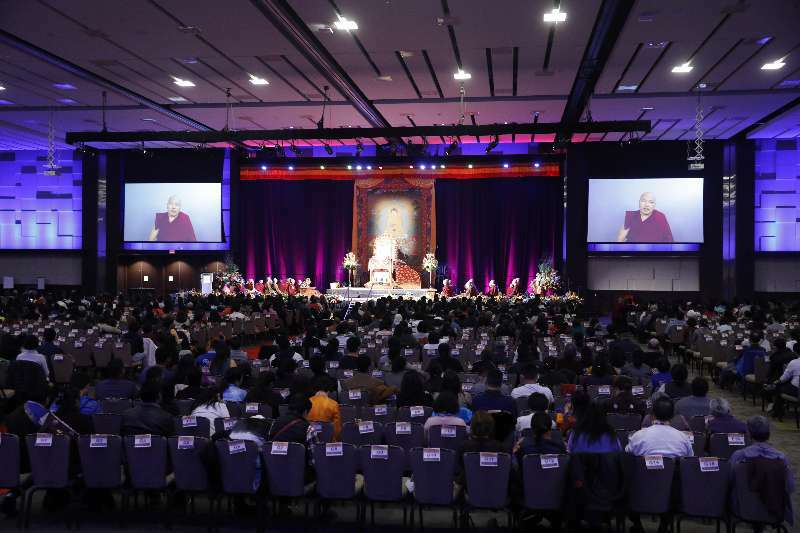 Especially, when we are reciting mantra, our mind should not stray elsewhere: Our awareness is fine-tuned and our attention is focused precisely on what we are practicing. If, however, we are saying the mantra while our mind is wandering, that discrepancy between what we are saying and thinking will keep our practice from becoming powerful. How we express ourselves physically and verbally is important; however, what really counts is remedying our minds, transforming ourselves from the inside. If we cannot do this, no matter how much we alter how we appear outside, we will have difficulties changing ourselves on a deep level. “If we wish to change ourselves fundamentally, we need to look inward and see our basic motivation, attitudes, and character. With sincerity a Dharma practitioner should watch and correct their mind, continually checking: ‘Is it aligned with my intentions or not?’ ‘Is it correct or not?’ We should investigate like this while reciting the mantra. This completes the third section on reciting the mantra. “We imagine that the mantra dissolves into emptiness, becoming inseparable from it, and we rest in that state. When we arise from it, infinite appearances emerge fresh and clear. These are pure appearances, different from the everyday phenomena of our surroundings that we usually encounter and take to be real and existent. The pure appearances are inseparable from emptiness, arising like the moon’s reflection in water. Memory and thought are the immense expanse of primordial wisdom. Since it might be a bit difficult to meditate on all forms as forms of Chenrezik, we could recall that just as we had imagined that our body like Chenrezik’s was emptiness and appearance inseparable, we could also imagine that all appearances are emptiness and appearance inseparable. Chenrezik’s body resembles the reflection of the moon in water—appearing while empty, and empty while appearing—and we can imagine that all appearances are like this. It is the same for sound. It might seem a bit strange to meditate on all sound and speech as the six-syllable mantra, thinking that this is all that will reach our ears. Ultimately, however, the mantra is not something superior to ordinary sounds and speech. They all are the same—sounds appearing while empty, and empty while appearing. The essential nature of Chenrezik’s mantra is inseparable from all sound and we rest in meditation on this. “This means, ‘May whatever virtue I have gathered through this practice as well as all the roots of virtue in my mindstream be dedicated for the benefit of all living beings, who all, in numbers vast as space, have been my mother. May they all swiftly attain the level of Chenrezik. May they all become similar to him.’ Essentially, we are praying for the ability to place all living beings on the level of Chenrezik. We could make other dedications similar to this as it does not make any difference which one we do. It is our intention that counts. This is the same with aspiration prayers. “From another perspective, having difficulties is a sign that we are making an effort. If we were not trying to do something, there would be no problems. When they arise, it means that we are on the road to accomplishing some objective, so we need not feel despondent, but see these complications as part of a larger picture. “In general, it is important to have a stable trust in our lama or spiritual friend, and we should also understand what this means. Many people place their trust in a teacher thinking that everything depends on that person. But if something happens that is a little bit out of line with their wishes, their trust in the lama immediately comes into question. Given this instability, we should look into the reasons why we placed our trust in the first place. We could be transferring the burden of responsibility for our lives onto the lama and then assuming that we have nothing to do. This will not work out. The reason we should be trusting our lama is that we are confident that they will give us oral instructions in harmony with the Dharma. Then we have to see if we can practice these instructions correctly or not. “If we do apply them properly and the expected results do not come, then we might have a reason for saying that these instructions from the lama I trusted do not help. The problem is that many of us do not practice following the lama’s counsel, but do what accords with our own wishes. When this does not work, we blame the lama for our failure. This is not right. 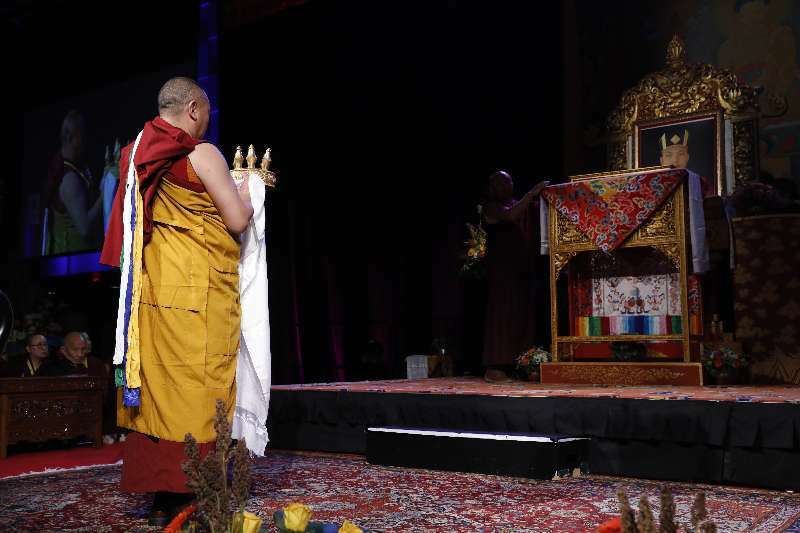 How is it then that we understand ‘having trust in the lama’? Whatever practice or project the lama gives us that accords with the Dharma, we carry it out as it was explained and blend it into the experience of our daily lives. “In sum, before we can trust others, we need to trust in ourselves. Usually, however, we do not trust but carry a lot of doubt about ourselves. Without self-confidence, it is difficult to find trust in others. This is something we should reflect upon. 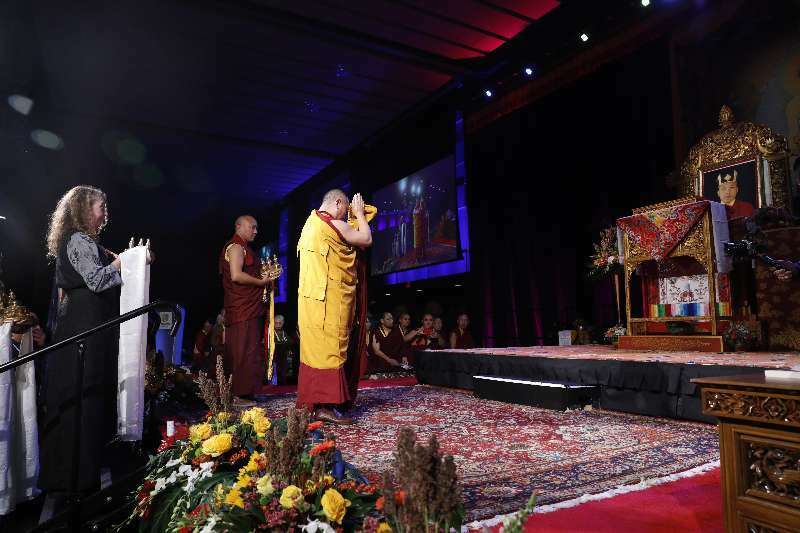 The Gyalwang Karmapa teaching the practice of Chenrezik and the mani mantra via live video stream. “Since I have the name of the Karmapa, many people think, ‘He must not have any problems. He can do whatever he wishes and never suffers.’ Since the Karmapas have reincarnated for hundreds of years, they are considered very special and prestigious, worthy of veneration. But over time, this type of thinking morphs into seeing the Karmapa as so highly honored that he transcends the human condition. “But if you take me for example, I am actually a regular human being, to whom a huge responsibility and an impressive name have been given, and that is what would differentiate me from others. Nevertheless, in people’s minds, this responsibility and importance are so spectacular that they pass beyond the human realm. It is difficult for me to perform the activity of someone who transcends this world. “Every human being has faults and various kinds of suffering. I have experienced many of these and also many problems that others to not face and so people worry about me. Since I am at the center of many different situations, I know difficulties that almost no one else would know in their entire lifetime. In addition, most people have someone, their friends or parents, to whom they can talk about their problems, but I do not since no one else is dealing with a similar situation and it is difficult to really understand what I tell them. When difficulties arise that are as huge as Mt. Meru, I am expected to solve them like a superhuman being, but I do not have those qualities, so these situations are hard to work with. “Nevertheless, no matter what expectations people might have of me as a human or superhuman, I try to do my best. If one day people would come to me and say, ‘You’re not the person in whom we placed our hopes. You’re just ordinary and you deceived us,’ it would not make a difference because though I’ve made mistakes, I have made a considerable effort to help others. I understand that no matter now hard I try, I cannot fulfill everyone’s expectations. For a long time, I have not practiced a lot of Dharma, but I have studied quite a lot so I think, ‘Let whatever problems there are come, I will not mind because I have the motivation to continually benefit others and to be loving and kind to them for all of my lifetimes. I will not stop doing this because there are obstacles or blocks in the road. With this morning talk His Holiness finished teaching on the practice of Chenrezik. The session was followed by everyone engaging in the practice of Tara with the aspiration of benefiting his health and well-being. How to practice the view of emptiness during the visualization of a deity or a mantra practice? The next question asked about the practice of Chenrezik and radiating lights to all beings to eliminate their suffering, which in actuality seems impossible. Why do we do this? The Karmapa replied, “The purpose is to train our minds. Our compassion is developed through the aspiration to eliminate all the suffering of living beings. Even if this does not actually happen, the thought, ‘Wouldn’t it be wonderful if it came true?’ gives us joy. Even if it is difficult to actually acomplish something or if they cannot, bodhisattvas still try to make it happen. Their aspirations are limitless, not restricted by ‘can’ or ‘cannot’; they work on what cannot be accomplished until it can be. You can watch the video recording of this teaching on Chenrezik over at YouTube. Subscribing to the channel will ensure you receiving notifications of any new uploads.